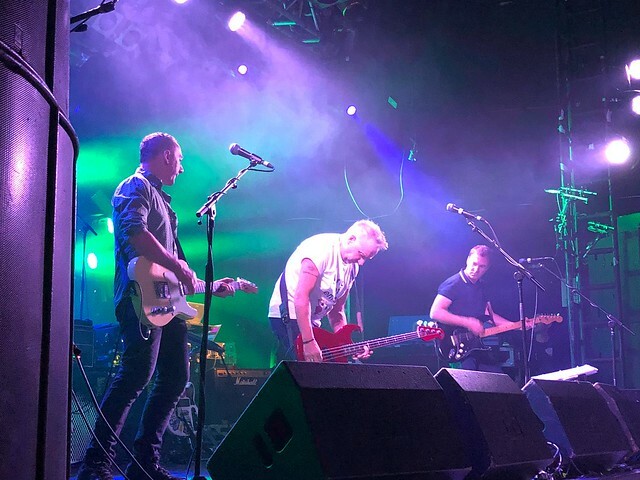 Continuing the seemingly infinite quest to play everywhere to everyone, and to play every song he’s ever released with Joy Division and New Order, Peter Hook and The Light now knock down albums 10 and 11. With the ability to play nearly every song from the 1977-1993 body of work, Hook and his band have become, like his former band, custodians of anthems that these days belong to the audience as much as they do the band themselves. 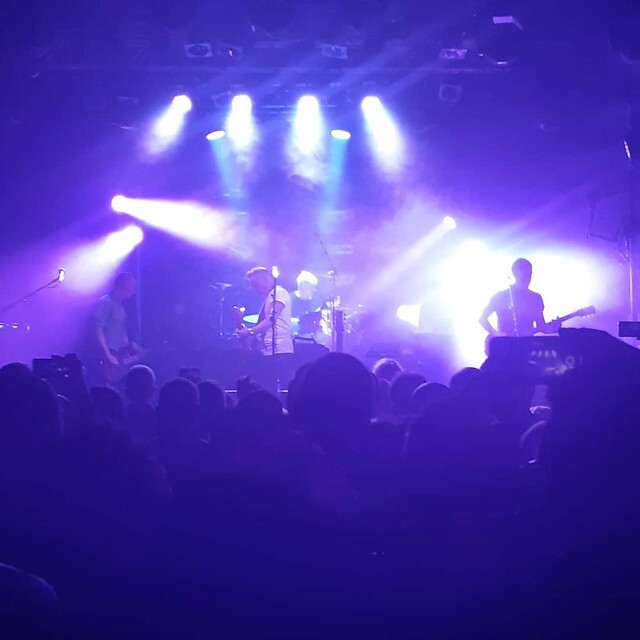 Moved hastily from the Camden Palace (not Koko, despite what legally may be the name), the Electric Ballroom is the stage that he first played as a member of Joy Division 40 years ago. And, as a result of the venue also having a night of hair ballads and Ultimate Power rock at 10pm, he’s on stage at 6.45 for a traditional three hour set that is all over by 9.45. Enough time for a pint post show. He opens, as is normal with an assortment of Joy Division songs. I’m beginning to think that I’ve seen those songs played enough now with at least half an hour of Joy Division songs played at every show I’ve seen him play. Sure, give it twenty five years, and I’ll be clamouring to see a member of Joy Division perform “Transmission”, in the way that when I was a twenty five year old in suburban nowhere, seeing a member of Joy Division perform any one of those songs was an abstract impossibility. Flashback to the 1997 Monaco tour, which saw that band perform “Failures” to a rabid ballroom in Wolverhampton, and maybe it’s time to rest the Joy Division legacy for a while and come back to it later. It sure is weird, to see the band perform something as punishing as “Autosuggestion”, then to be rampaging through the hands-in-the-air Baleric disco of “Fine Time” ten minutes later. The change in tone is a leap. For me at least, “Technique” was a transformative album. I came out of that album with my eyes and ears opened. Having not seen any songs from it performed in twenty years, its surprising, but also exciting : the songs are as good as they ever were. They have aged elegantly, though now are promises of a future that never quite happened. The first side of the album – “All the Way”, “Love less”, “Round & Round”, “Guilty Partner” are largely guitar based rockier numbers. It’s probably around the time of “Round & Round”, which sounds the same, yet different, that I kind of realise I’m a few minutes away from seeing something important to me. “Round & Round” is perfectly executed. It’s stunning that this hasn’t been a staple of the setlist since the dawn of time. Other, lesser bands would make something like this a must-play-every-night concert staple. 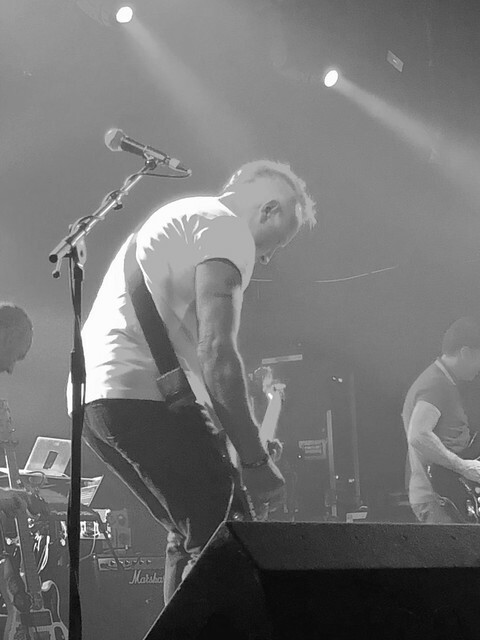 For Hooky’s former band, it’s been played only 7 times in the past 25 years. For me, this album was an eye opening way in to a much bigger world ; where things like indie, electronic, and so on, just became squashed into one category : good music. At the end of “Guilty Partner”, we turn to four songs that, in my eyes form the best single side of vinyl ever pressed. “Run”, “Mr.Disco”, “Vanishing Point” and “Dream Attack”. Since I was a spindly 15 year old when they toured these songs, I had no chance to see these performed live then. Now I see them now. What is also obvious is that Hook is performing the album, as the album, in full. The live arrangement of “Mr.Disco” had a very different (and equally fabulous) middle-section the band never recorded which isn’t here, replacing it with a duelling bass/guitar solo that was on the record. The whole thing sounds perfect. And then there’s my favourite New Order song, ever. “Vanishing Point”. In the confines of an ancient ballroom, the driving rhythms, Italian House pianos, and great big disco stabs sound as good now as they did then. We’re all older, bigger, wiser, but also.. we’re still here. I’ve waited a long time to see these songs played live, and I wasn’t disappointed. On stage, the songs from these two albums – New Order’s commercial high points – are rarities. “Technique” was born in the midst of a separation, and the lyrics are ones that Barney Sumner rarely wants to revisit : “Republic” was born in the midst of bankruptcy through a sense of commercial obligation. That said, on stage, the songs from both of these albums betray none of this. In fact, more than half of Republic has never been played live by New Order. Aside from “Regret”, its largely been written out of history. So, for me, I’ve never seen 15 of tonights songs played live ever, by anyone. “Republic” may be just a record, but it has a distinctly formative place in my life : I remember sitting in a Burger King in Leicester with the CD, thinking This Is The Last New Order Album I Will Hear. I was wrong, but there was no knowledge of the future. There never is. “Regret” is the one which I can most easily compare with New Order live. What is clear is that Hooky is rightly proud of these songs and his role in their creation. To see where the bands differ though, you have to look at what they are doing now. 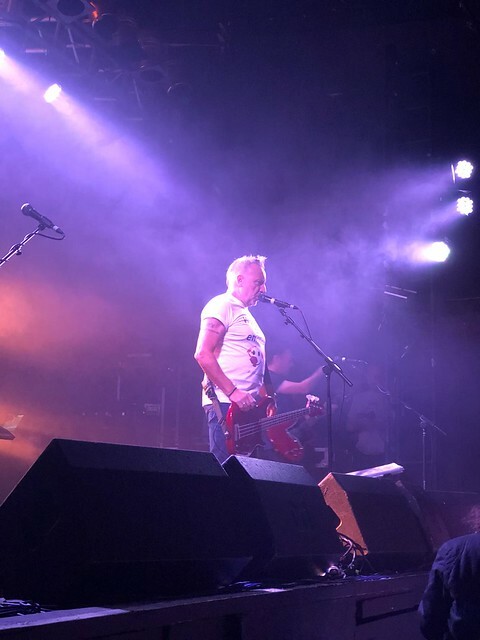 Hooky plays 70 or shows a year, and is determined to perform almost every song he recorded. New Order play less often. Hooky would, were he in charge of New Order, probably have been playing frequently with varied setlists, probably like some electronic version of Pearl Jam with three hour sets, the ability to play anything from the body of work, and always out there somewhere. His band, The Light have largely been together since 1996 or so, and acquit themselves and the songs faithfully. The songs are more muscular, more assertative, given a different lease of life on stage. On record, “Republic” especially sounded like a studio creation that had perhaps been mixed a bit too often and became lacking in spark. On stage, the songs feel alive. “World”, which I’ve known for 25 years before seeing it performed live, bounces playfully like I always thought and hoped it would. “Ruined In A Day” is reimagined with a break into the godlike K-Klass remix that makes the song even better than it was. After this, it’s nothing but songs New Order haven’t performed since 1993, if at all. “Spooky” is perhaps the most.. interesting. Never performed live by any member of New Order before this week, it’s absence is baffling. The song is streamlined, a blend of the numerous remixes and alternate versions, powering along assuredly, vocals shared evenly between Hook and Pottsy, and glistening with a modern incarnation. Alongside many of the songs tonight, it would become a live classic – if it had been played live more often. The show drops pace for ”Everyone Everywhere”. Given that I’ll never get to travel back in time to see New Order in 1989 or 1993, this is probably the closest anyone can get. Like other artists of advancing years that don’t release songs anymore, Hook is recreating the past and, to some extent, reclaiming a sense of ownership over those songs. These things are always driven by a mix of ego and pride. Hook’s voice tends to suit the Joy Division material better, but more than adequately matches the songs and I do wish he’d sung more in New Order. 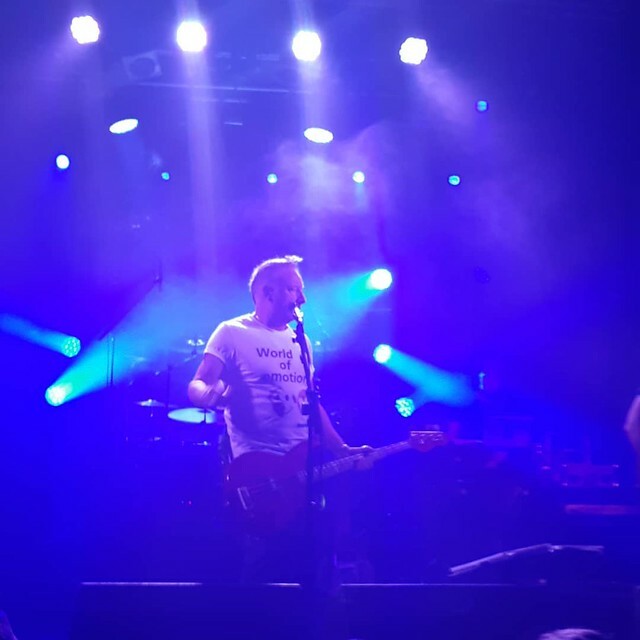 The second half of “Republic” is a banquet of rarely served treats : “Young Offender”, “Liar”, “Chemical” and “Times Change” have never been played live by any member of New Order, and it’s a bit odd. Seeing these songs performed live for the first time, a quarter century after release, is a little strange – but also, rewarding. In the new configuration, the band have to do things and play instruments, and so the sound is thicker, stronger, with lovely guitar embellishments, textures and vocals that make the songs sound just that little bit more complete. “Avalanche” isn’t included ; it’s a song Hooky made no contribution to so seems a little strange to try. Encore time comes (and its not even 9.15pm). There’s a four header of “World In Motion”, “Blue Monday”, “Temptation” and “Love Will Tear Us Apart”. There was a time the thought of seeing any of those songs live was my holy grail : now it’s the sound of a rowdy Friday night. Inevitably the question comes down to which one you prefer? Hook or New Order? And do we have to choose? Both are valid, both offer a rewarding experience, and both are authentic in presentation and sound. There’s no winners, as such. Both are now free to follow their own path, and that is perhaps the victory – as best we can enjoy it. I waited 30 years to see some of these songs live – and it was worth the wait. p.s. pictures from "Stage Left" by Hebe Katia.